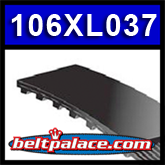 106XL037 Synchronous Belt: 10.6" Length, 53 Teeth. Replaces: Jason 106xl-037, Gates product 92571362, OPTIBELT-ZR 106 XL 037. Ryobi Band Saw BS901 drive belt. Mastercraft Bandsaw drive belt - 106XL 3/8" Wide.